Whether you plan to hang out at the beach, pound the city pavements during a summer storm or visit a water park, having the best waterproof bags is important for making sure your travel gear stays dry and safe from water damage. Now that so many of us travel with multiple electronics like phones, tablets, cameras, Kindles, power banks and other gadgets, it is more important than ever to keep our devices dry. Plus, who wants to get dressed into damp clothes? We were recently in Thailand during the Song Kran New Year celebrations, where we got well and truly soaked for two days solid. This gave us a great opportunity to road test different waterproofing for travel gear of our own, so we decided to share our wisdom in this handy guide! With more and more different waterproof equipment on the market we can show you the best waterproof bags for packing up your travel gear, to help decide what might be the right thing for you. It’s important to understand the differences between waterproof, water resistant and water repellent. This will help you to choose the right product for you and your travel needs. After all, protecting your travel gear from the odd rainstorm is going to be different than if you are planning to go rafting or swimming in the sea. Water-resistant: Products labelled as water resistant offer the lowest protection against water. In most cases, the fabric has been impregnated with a light substance to improve its endurance to regular water exposure such as light rain. However, the water-resistant fabric does not offer protection against ongoing water exposure like long and heavy rain or standing under a waterfall. Water-repellent: The next level of protection. Products that are water-repellent are treated with a stronger substance like for example Gore-Tex (a waterproof, breathable fabric membrane). This gives them the ability to withstand longer and heavier exposure to water, like a rainstorm. Waterproof: If something is waterproof it means that the fabric is 100% impermeable to water. This is achieved with a technique called seam sealing. It means that the stitch holes and the fabric itself get completely sealed from external conditions. This procedure provides the highest protection against water. So with an understanding of what the different terms mean, we can move onto the products. This is one of the first layers of protection against water. Having the best waterproof backpack lets you travel in the worst weather without fear that your precious gadgets and clothes might get wet. This 45-litre dry backpack is a perfect choice for everyone who loves to hike and wants to keep their stuff dry. The Highlander Outdoor Discovery 45l is water-repellent and has an additional integrated rain cover included. This should definitely keep your stuff dry on the road! The Adjustable Back System (ABS) makes sure that the backpack lies very comfortably on your back. Its built-in hydration port allows you to store a water bladder inside so that you can and drink on the go. All this makes this product the best waterproof backpack for travel and hiking we have found. This 35l backpack is actually fully waterproof and very sturdy. This makes it a perfect companion for your outdoor adventures. It comes with a small side compartment with a waterproof zipper which is very good if you need something out of it quickly. The roll top guarantees that the backpack is completely waterproof. An additional pocket on the inside of the Earth Pak makes it a lot easier to organise your belongings. What we really like about this backpack are the padded shoulder straps and the sternum strap. These features make it very comfortable to carry this waterproof backpack. Weighing less than 0.5 pounds, this water-resistant backpack is a proper lightweight product. This doesn’t stop it from being awesome against showers though, as it is made with a highly rip and water-resistant nylon fabric. Because you can fold it into a little bag it means you can always easily stow it away when you don’t need it. As it is “only” water-resistant, if you are planning to go anywhere seriously wet then we recommend to put any important things into separate dry packs and then put them in the backpack. What if you already have an awesome backpack and don’t want to invest in a new one? Then you should consider investing in a high-quality rain cover for your backpack, like for example the Mountainsmith Backpack Rain Cover for daypacks and smaller backpacks. The person who invented the simple dry bag should get a reward. This waterproof bag really makes travelling in wet conditions worry-free. We never travel without at least a few of these each to make sure we can protect all our valuable electronics. Pro Tip: When going into the water with one of your dry bags, double-bag them. That $1000 camera? Put it in a small drybag and then in a bigger one. This waterproof dry bag was recommended by the New York Times Bestseller and entrepreneur Tim Ferriss. The bags come in various sizes (10l, 20l, 30l, and 40l) and all of them with attached straps. While the 10l dry bag and the 20l dry bag come with a shoulder strap, the bigger sizes come with backpack style shoulder straps and a sternum strap. This is probably the best waterproof bag for swimming and other water activities like rafting or kayaking. Since we travelled to Asia for the first time in 2015 and attended our first Thai New Year, we trust in the Sea to Summit Ultra-Sil Dry Sack. None of our possessions got wet during this crazy water festival! The water-repellent bags come in sizes ranging from 1 litre to 35 litres. Especially the smaller ones like the 2l dry bag are perfect to protect a camera, a tablet or your phone from the water. The material is very durable, which makes them some of the best waterproof bags. This bag has no attached strap, but you can get ones with a strap from the same manufacturer. They are not suitable for submerging, but they will keep your stuff try through a heavy amount of splashing. This watertight duffel bag is very popular and is very good value on price. It comes in 10l and 20l sizes and has a handy attached strap. What makes this bag stand out compared to other brands is that it has an extra long strap and the 20-litre bag comes even with an attached handle to make carrying it easier. 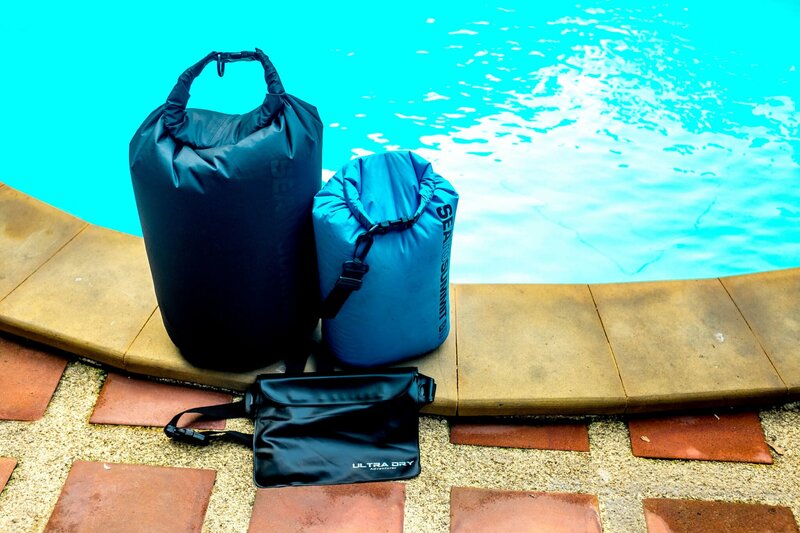 This waterproof floating bag is a good alternative to the Earth Pak. Now waist pouches might not be the most attractive thing ever, but they are really useful. Especially if you don’t only want to keep your belongings dry but also safe. This set comes with 2 big pouches and 4 smaller ones to put into the big ones. They are great for smaller valuables you want to keep close to your person like your phone, wallet or keys. We are huge fans of those drybags! With stuff like phones, wallets and other expensive things we always want to be very confident that our stuff will not get wet when we are doing water-based adventure sports, or plan to swim at the beach (we NEVER leave our stuff unattended on a beach). It means we can even take our iPads to the beach to do some reading, then when we go for a swim we pack them in one of the aLoksaks first and then put it in another waterproof drybag. So far we never had any water damage on any of our devices we protected with this technique. And you don’t just have to take our word for it – these babies are certified by Scuba Schools International as being waterproof up to (or down to) 60 metres (200ft). They are even used by the US Military. Better dry than sorry. The waterproof phone pouch has come a long way since the first one came out. While it once protected your phone from splashes of water you can actually now dive up to 30 metres deep with waterproof phone cases these days. Pro Tip: Always test your waterproof phone pouch with some paper or cotton wool. A waterproof pouch with water-tight protection. The quality of the pictures shot with a phone in this pouch under water are just amazing! The product promises to be IPX-8 certified, which means it is suitable for continual water submersion. The price is very cheap as well. It is compatible for devices up to 6 inches in size. This waterproof phone pouch comes with a lifetime warranty and a no-questions-asked 30-day money back guarantee. It is IPX-8 certified so you can dive up to 30m deep with it. The phone pouch comes with an adjustable lanyard and an adjustable armband, and fits phones up to 6 inches. While this one also comes with a IPX-8 certificate, it has an added bonus over the others – it floats. This makes it the best waterproof pouch for swimming. The floating effect comes in quite handy if you lose your grip of it in the sea. Not sure about the colour? This one comes in 15 different colours, including some glow in the dark. It fits phones up to 6 inches, has a 100% money back guarantee and a lifetime warranty. In our view, this might be the best waterproof case. If you don’t fancy carrying your iPhone X around you with in a pouch, we can absolutely recommend you get yourself one of those actually waterproof cases. Unlike the pouches it also gives your phone protection from bumps and drops. The phone case also offers protection for submersion up to 30 minutes. Although we are currently still wringing the last life out of our iPhone 6’s, we have a very similar phone case and it has kept our phones dry even during our recent Song Kran adventures. So that rounds up our list! We hope that this article could help you to find the best waterproof bags for traveling. We have travelled with waterproof gear since 2015, and never regretted it. Like this post? Then pin it for later! If you also want to find out how to keep your belongings safe while travelling, then check out our other post: Best Anti Theft Travel Bags and Accessories To Keep Your Travel Gear Safe. If you know any other awesome waterproof bags or want to share any experiences where you’d have been glad you had a waterproof bag with you, then let us know in the comments! Until next time, travel safely and now, travel dry.